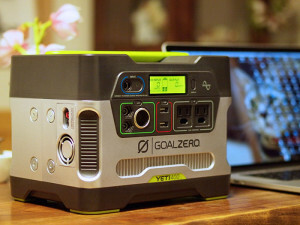 The Goal Zero Yeti 400 Solar Generator allows you to live life off the grid, camp in luxury, or power through an outage without the noise and fumes of traditional back-up generators. This power pack is an environmentally-friendly pack. It is quiet, portable power for base camps, cabins and unexpected outages. This solar generator is stronger than the previously mentioned Yeti 150 but the quality remains. Solar charging times vary depending on weather and the solar panel used; with a Boulder 30 solar panel it can charge in about 26-52 hours or with Boulder 15 solar panel in 53-106 hours. If you are using the wall charger it can charge in about 5 hours, and with the 12V car charger, which is not included, in about 13 hours. It can power laptops, TVs, tablets, lights, smartphones, cameras, e-readers, MP3 players and more and is compatible with USB, 12V and standard AC inverter plugs. In the package you will find the reliable Goal Zero Yeti 400 Power Pack, a wall charger and a 4.7mm to 8.0mm Legacy Nomad Panel Adapter. You get what you paid for. The dimensions of the generator are 10.25 x 8 x 8″ / 26 x 20.3 x 20.3 cm and it weighs 13.2 kg or 29 lbs., personally a bit heavy for my taste, but certainly more powerful. It utilizes a 396Wh AGM lead acid battery that can charge devices from smart phones and laptops. Since it uses a deep cycle battery, it works without noise and produces no exhaust. The front display panel provides readouts of incoming and outgoing power, and battery status in 20% increments. This real-time feedback enables precise power management. The Yeti provides an array of output options for any energy need. It has two standard 110VAC grounded wall plugs, two standard USB ports, a 12VDC car/vehicle port and two 6mm 12VDC plug ports. For additional battery power, the Yeti is chainable with other units. The battery is removable, so it can be upgraded or replaced as needed. You can chain multiple generators together for increased output and the generator operates in temperatures ranging from 32° to 104° F (0° to 40° C) – same as Yeti 150. I have been testing the capabilities of this set up here at home prior to taking it out camping (I recommend doing this for all outdoor equipment). As a power supply the Yeti 400 has performed flawlessly. I have powered (at one time) an iPhone 5 (and 6s), iPad 2, a Toshiba laptop, and a household lamp with a 13w CFL bulb. In short it passed the test! Goal Zero guys come up with really cool products. And this one, with a Boulder 30 works like magic. It has a USB port, a 6mm port, a 12V car port, an AC Inverter and a power pole changing port. All the ports you need! 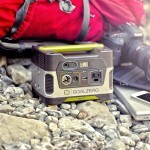 Next Post Review: Why the Goal Zero Yeti 1250 is the best Solar Generator in the market?